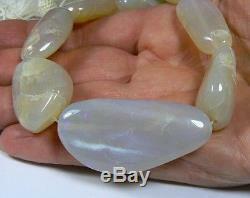 RARE BIG NATURAL UNTREATED SOLID GEL AUSTRALIAN LIGHTNING RIDGE OPAL BEADS 390ct. 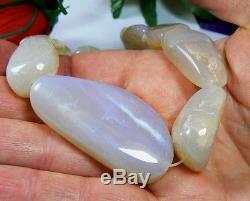 19 RARE GORGEOUS BIG GENUINE AUSTRALIAN OPALS!! 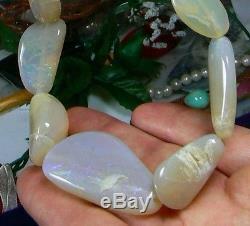 19 VERY RARE BIG NATURAL OPALS FROM LIGHTNING RIDGE!! 78 grams = 390 CARAT WEIGHT!!! THE OPAL MEASURES 20-45mm LONG x 11-23mm WIDE x 6-12mm WIDE!! THESE OPALS ARE FROM LIGHTNING RIDGE MINE (AUSTRALIA)!! 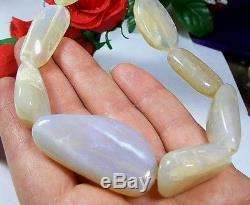 BEAUTIFUL NATURAL UNTREATED JELLY BLUE COLOR WITH ORANGE GOLDEN GLOWING INSIDE!! BECAUSE OF RARE BIG SIZE, NATURAL INCLUSIONS, CRACKS AND CHIPS PRESENT!!! 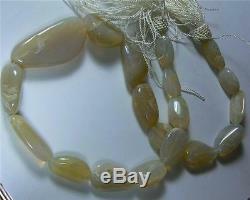 RARE SOLID AUSTRALIAN OPAL BEADS!! THE OPAL LOOKS MUCH BETTER IN PERSON!!! 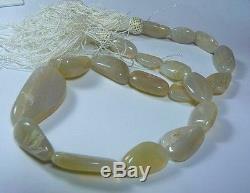 Perfect to your Custom jewelry or Collection! 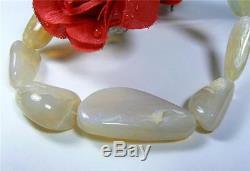 Can be used as absolutely gorgeous central pierce, amulet, talisman. 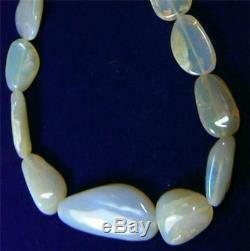 The Romans believed opal brought the owner good fortune and carried the gem as a good luck charm. These opals are naturally mined in LIGHTNING RIDGE (AUSTRALIA)!! 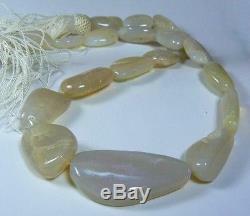 I HAVE GREAT SELECTION OF STANDARD FORM AND UNIQUE GEMSTONES AND FRESHWATER AND TAHITIAN SOUTH SEA PEARLS!! 5 0 for each additional item ships in the same package (must be paid together). 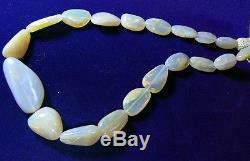 The item "RARE BIG NATURAL UNTREATED SOLID GEL AUSTRALIAN LIGHTNING RIDGE OPAL BEADS 390ct" is in sale since Thursday, April 26, 2012. 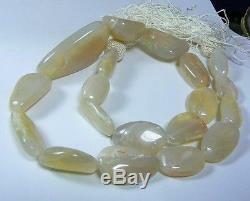 This item is in the category "Jewelry & Watches\Loose Beads\Stone". The seller is "aphrodita_8" and is located in Brooklyn, New York.